Multithreaded will test your CPU's efficiency of running more than one thread without major system lag. The higher you score on this one, the more threads your CPU can handle with a comfortable speed. High multithreaded scores generally means you can render things faster. 4 Threaded tests your CPU's performance in games, since most games currently run on 4 threads. Singlethreaded evaluates how fast the CPU can handle a single, dedicated thread of processing. Chances of the 4 Threaded benchmark running only 2 threads greatly reduced. New program design for a more professional look (by Timmie). Different scaling protocols; Multithreaded now scales much higher than before. New methods to evaluate the CPU's performance, especially in the 4-threaded test. 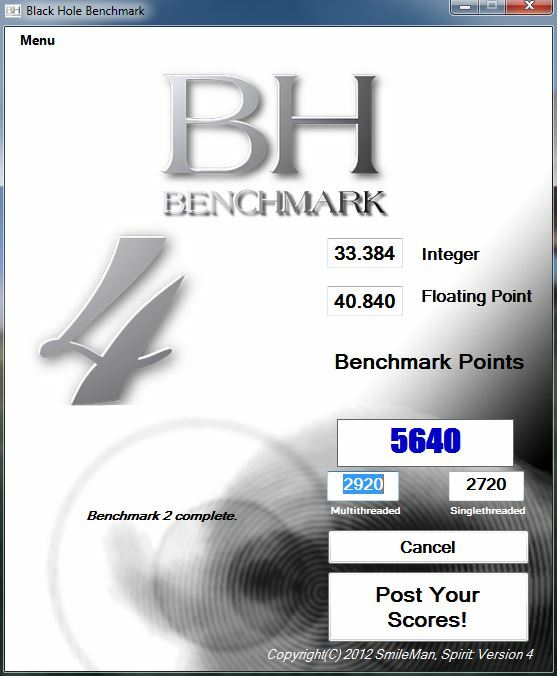 The benchmark is now exclusively 32bit (still works on 64bit machines, of course). Very small chance of the 4 Threaded test to only run 2 threads. No other known bugs currently - Report bugs on our website. 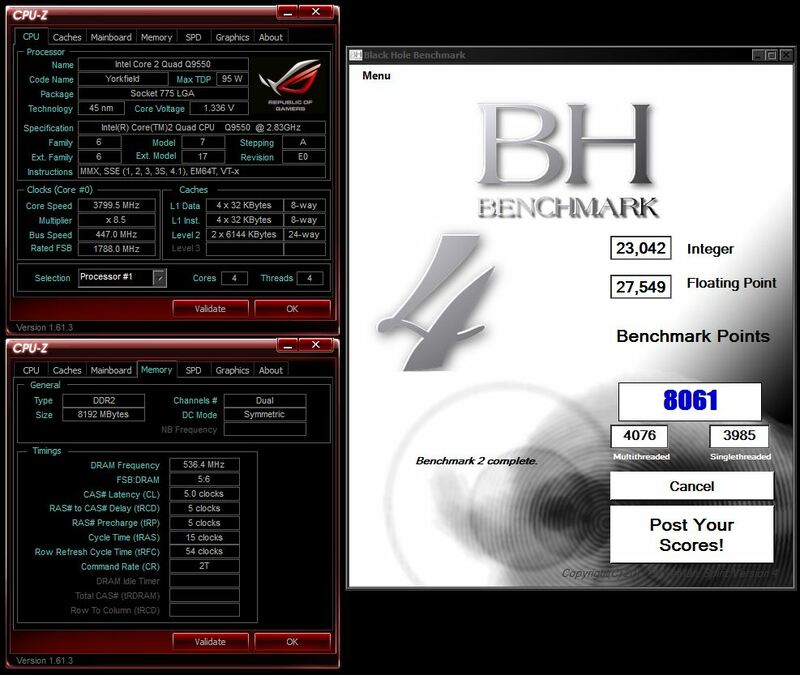 Black Hole Benchmark is designed to run on Windows XP and newer. You must have .NET framework 2.1 or greater installed to run the benchmark. 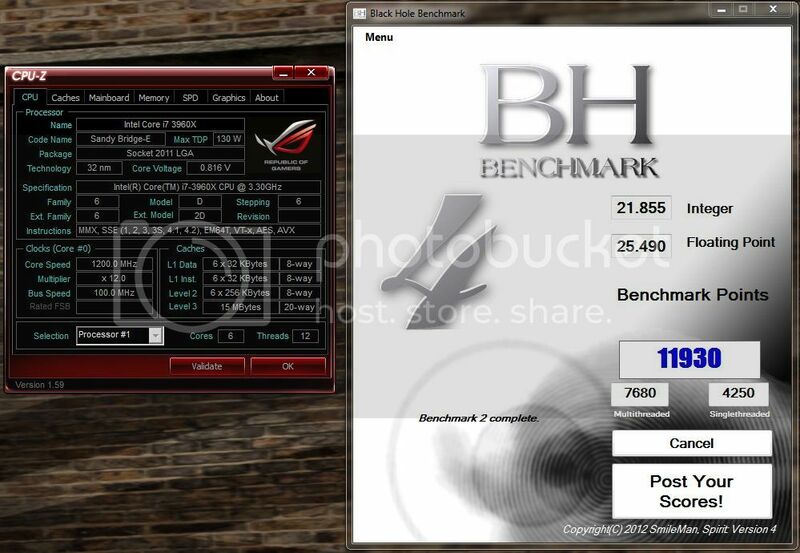 System RAM speed and latency can have minor effects on a PC's final score. The benchmark supports up to 34 threads. There's a joke here somewhere, I just can't put my finger on it. Thanks XBEAST, I've updated the download with a non-ilivid version. hmmm, it says v.3 here , not v.4.1. be right back with some Scores..
downloaded several times......crash,crash and more crash, it don't work for me !! You're my second person with this problem. Did you update to latest .NET framework? I thought, I'll join the forum. Thanks for testing all, my database went from 60 to 75 tests in a short time! Maybe you guys are interested to do the first hardware review based on this? On it or in it ? Same issue here. Noticed we're both using AMD processors, maybe certain ones trigger it. Maybe not. Yep, can't fix that. It stresses all threads to 100% and most programs will be stuck while running the benchmark. Refuses to run on my FX rig though.....get a stop responding message. After I seen many results, I can see AMD is always in disadvantage in terms of the integer pass. I might try to look for fixes in the next version.